Orbicella faveolata is an important ­reef-building coral that forms large, ­mountainous colonies. Juvenile corals are rather mundane, while adult colonies can grow to an impressive size. Orbicella grows by encrusting. A new colony can start from a single polyp, which grows outward from the base. You can see a slightly lighter color on the growing edge of the colony where new polyps are emerging. Orbicella grows into thick, hearty ­colonies, which make the ideal candidate for ­fragmentation and coral restoration. Small 15 mm to 20 mm fragments can be cut from adult colonies using a diamond band saw. These fragments can be glued onto ceramic frag plugs and grown in salt water until they double or triple in size. At this point, tiny Orbicella colonies can be transplanted back to the reef. 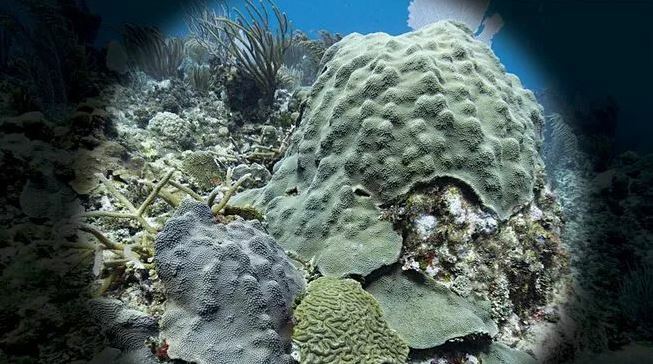 As they grow, their skeletons add a considerable mass to the reef, and over time they can help stabilize loose rocks or decaying reef structure. The common name for this coral is mountainous star coral because of its size and characteristic peaks and ridges. Polyps are small at about a half-inch across. When polyps are retracted, Orbicella corallites have tiny grooves that give it a ­starlike ­appearance. Orbicella is coral that could be overlooked. From a few meters away, you might think this coral is just a rock or simply consider it as part of the reef. Divers are often more focused on looking for fish, turtles, rays and eels than trying to describe coral. But Orbicella is an important coral to the overall health and growth of the reef. To really see the beauty in this coral, look for large colonies or colonies of contrasting colors growing next to each other. Until recently, Orbicella was classified as part of the Montastrea family. You can still find this coral listed as Montastrea faveolata, however, the current description is Orbicella. Scotland: Diver death skipper avoids jail following safety breach; "tragic accident"